Phil Pressel, designer of the KH-9 HEXAGON's 'optical bar' panoramic camera system, poses in front of the massive 60-foot long spy satellite at the Smithsonian National Air & Space Museum's Udvar-Hazy Center on Sept. 17, 2011. The National Reconnaissance Office declassified and displayed the KH-9 for one-day-only at the Virginia museum. CHANTILLY, Va. — Phil Pressel had kept a secret for 46 years. A secret that he shared with no one, not even his wife, since he first went to work for the Perkin-Elmer optics company in 1965. 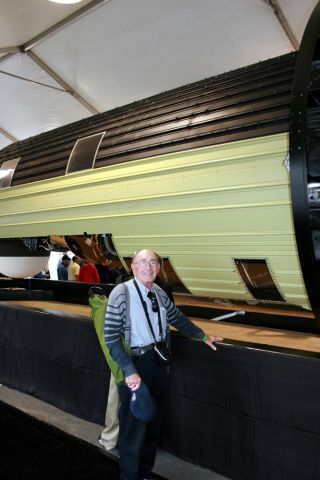 On Sept. 17, the 74-year old Holocaust survivor and kidney transplant recipient patiently waited in line with his wife as the doors opened to a large tent structure here at the Smithsonian National Air & Space Museum's Udvar-Hazy Center. His lifelong secret, one of the United States' most closely guarded assets, a behemoth larger than a school bus, was now on display for the whole world to see: the just-declassified KH-9 HEXAGON spy satellite. Incorporated into the belly of the giant spacecraft was the 'optical bar' camera system that produced incredibly valuable intelligence data for his adopted country; detailed imagery that helped prevent a cataclysmic World War III between the global superpowers. These cameras, designed by Phil Pressel, are a secret no more. Just moments after the burden of secrecy was finally lifted from his shoulders, an exuberant Pressel, beaming with pride, shared his experience with SPACE.com. "I teared up when I first saw the HEXAGON on display," Pressel said. "Then, I saw my optical bar [cameras]. I was responsible for the whole optical camera system and there are many, many other important subassemblies designed by others. It was overwhelming. This is still the most complicated system we've ever put into orbit, period." Pressel spent many years vowed to silence on his work. "I lived with secrecy at Perkin-Elmer for 30 years. We were never allowed to talk about anything," he said. "We couldn't use the word 'film,' we could never use 'HEXAGON,' we couldn't say 'optical bar' and other words. We used abbreviations and we had to talk in code." That shroud of secrecy even extended to his wife. "I never knew what Phil was working on, nor did I ask," confided Pat Pressel. "It was just part of our daily existence. He would come home from work, I'd ask 'How was your day at the office?' and that was it. Even on his business trips, the only thing I knew was what city he was in." Pressel was hired by the Connecticut-based instrumentation manufacturer Perkin-Elmer in 1965 to work on a "special project" for the government. He soon realized that this would be no ordinary engineering job. "I worked on the design study for the HEXAGON program for almost two years," Pressel said. "We had various concepts, various systems and we finally settled on a design in the spring of 1966. We were competing against Itek Corporation [manufacturer of the camera in the first U.S. photo-reconnaissance satellite program, CORONA]. Finally, on Oct. 10, 1966, our vice-president gathered us together, lit a cigar and informed us that we had won the HEXAGON contract." Pressel and his colleagues watched with great anticipation as the first KH-9 HEXAGON lifted off on June 15, 1971, from California's Vandenberg Air Force Base. Seasoned launch teams at the guarded facility were astounded by the sheer size of the Titan III-D launch vehicle and its massive secret payload. They nicknamed it the "Big Bird," a moniker that quickly became synonymous for all United States imaging spacecraft. After achieving orbit, the KH-9 HEXAGON was commanded to begin its on-orbit checkout and calibration procedures. Phil Pressel's twin "optical bar" panoramic cameras began rotating, sweeping back and forth as the satellite flew over Earth, a process that intelligence officials later referred to as "mowing the lawn." Phil Pressel (fourth from left) joins other National Reconnaissance Office veterans in a group photograph in front of the 60-foot long KH-9 HEXAGON spy satellite. This gathering of former NRO contractors was finally able to share stories of their once-secret work with family and friends at a celebration marking the NRO's 50th anniversary. The KH-9 was declassified and displayed at the Smithsonian National Air & Space Museum's Udvar-Hazy Center on Sept. 17, 2011. The HEXAGON was a search system, designed to capture military construction projects, repositioning of troops and materiel, radar installations and activity at submarine bases and airfields. Each sweep of the camera photographed a wide swath of terrain covering 370 nautical miles — the distance from Cincinnati to Washington — on every orbital pass over the former Soviet Union and China. One of the rotating cameras looked forward of the satellite while the other looked aft, capturing detailed imagery with a resolution of about 2 to 3 feet (0.6 to nearly 1 meter), according to the National Reconnaissance Office (NRO). "The whole camera system operated in a vacuum, except for the film which was in a pressurized container," explained Pressel. "The most remarkable thing was the amazing speed at which the film traveled through the camera systems and the manner it passes by the camera's focal plane." The NRO has released details of the film transporter's unique "twister" system as well as the film's astounding speed as it wound through the cameras. Riding on a curtain of air instead of mechanical rollers, the film moved 200 inches per second at the camera's focal plane. The twister kept the film flowing linearly in parallel with the focal plane as the camera rotated and as the Earth moved below, rewinding the film back into its supply reel, and then repositioning the film for the next exposure. This innovative "air bar twister" technique, described in a declassified NRO history as "the key component in the optical bar" cameras, made maximum use of the 60 miles (320,000 feet) of 6.5-inch wide, high resolution Kodak film packed into the 60-foot long KH-9 HEXAGON spacecraft. A close look at the rear engine used on the National Reconnaissance Office's HEXAGON spy satellites during a display at the National Air and Space Museum's Udvar-Hazy Center at Dulles Airport, Va., on Sept. 17, 2011. Once the on-orbit checkout was completed, one of the KH-9's four re-entry vehicles — the film "bucket" — plunged through Earth's atmosphere. A specially modified C-130 aircraft would catch the return capsule in mid-air by snagging its parachute following the canister's re-entry. "When we first saw some of the first photographs taken of the United States, I was so very, very proud," Pressel said. "It was 'Wow!' The HEXAGON was so complicated that many of us had doubts that it would actually work. And, when it did work, we were simply amazed. It worked magnificently." His lifetime's secret work now on public display, Phil Pressel explained his motivation. "I never wanted to work on an offensive weapon system, something that would kill people," he said. "I am happy that I always worked on reconnaissance projects, projects that secured our country."